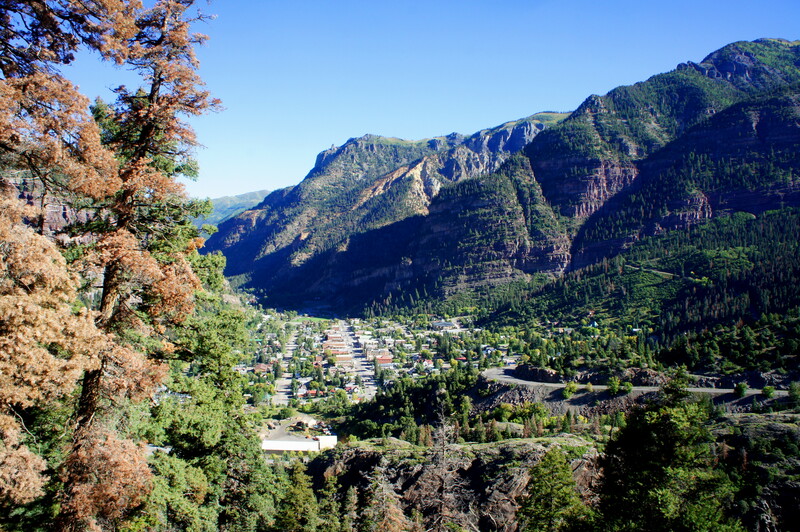 The Sutton Mine Trail—situated just south of Ouray, Colorado—rewards hearty hikers who brave the initial, gut-wrenching ascent with spectacular views of Ouray, Uncompahgre Gorge, Bear Creek Falls, and Abrams Mountain. Ending at an abandoned mine, this 2.2-mile jaunt packs nearly 700 feet in elevation gain into the first half-mile before leveling out atop a rocky plateau in the shadow of Hayden Mountain. With the best views to the east, hike in the afternoon after the morning shadows have lifted. 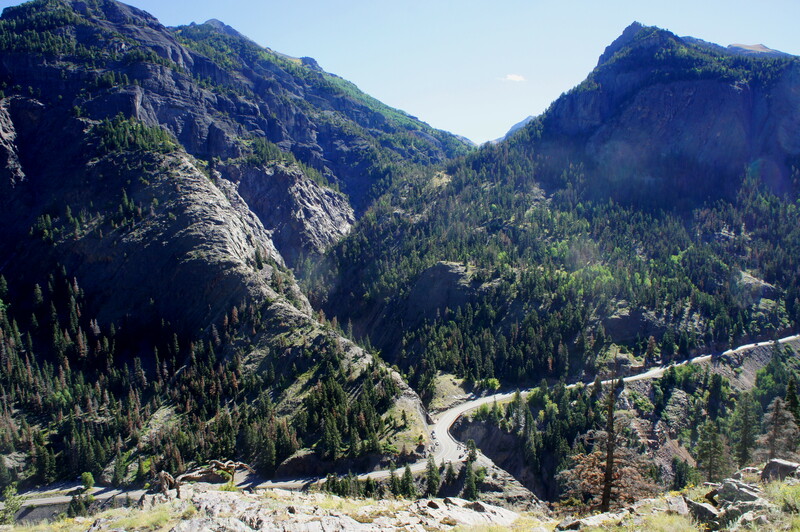 From Ouray, drive (or walk) 6/10 mile up Route 550—the so-called “Million Dollar Highway”—and turn right on the unpaved Camp Bird Road. Passing a maintenance shed on the left, round the hairpin bend and park 4/10 up Camp Bird Road on the right, where there is space available on the shoulder. Look for the “Sutton Mine Trailhead” sign across the road; this is your cue to leave the road and start climbing. The narrow singletrack wastes no time in gaining elevation as it reaches a trail register in about 50 yards. Edging southward, the trail quickly puts distance between it and the service road visible below and then plunges into a thick conifer forest. At about 120 yards, hikers will round a pair of switchbacks, the first of a series. The second set of switchbacks comes at around 2/10 mile; by now you have already gained more than 250 feet. A third follows minutes later, then a fourth pair at 0.35 miles. After doubling back to the west at 4/10 mile, the unyielding incline increases further, requiring careful footing to clear some rocky obstacles. 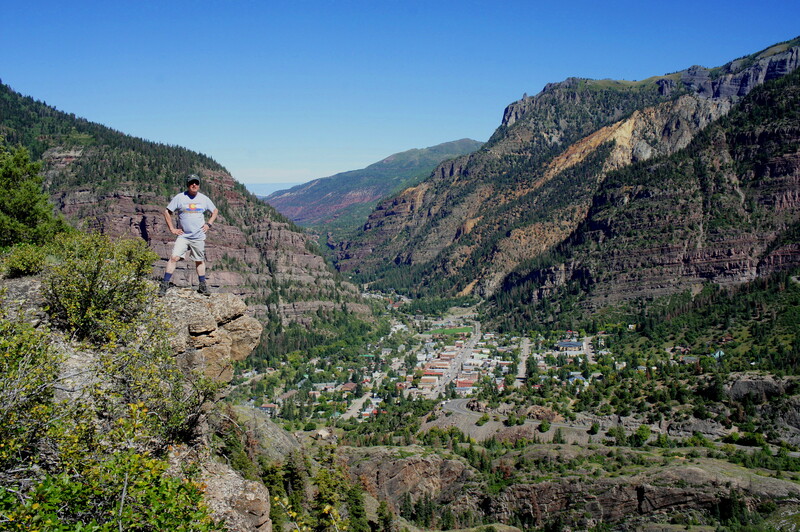 At ½ mile, the trail rounds a sharp corner and climbs to Ouray Overlook, which offers an excellent vantage point looking north. 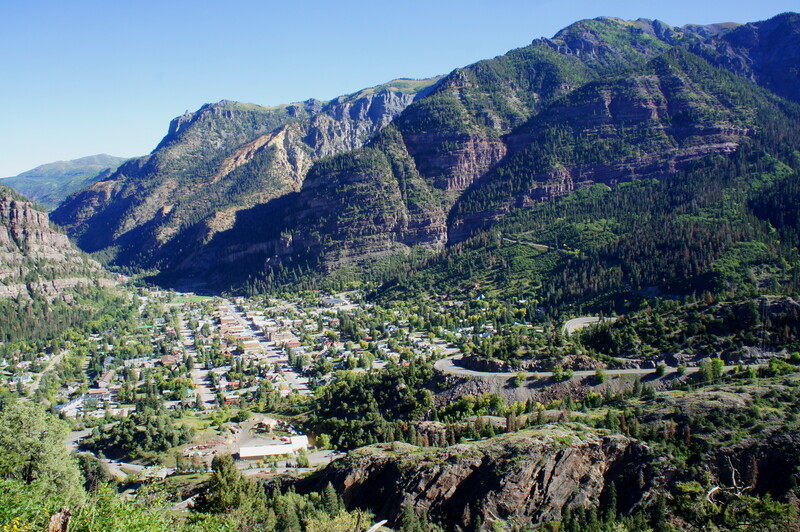 Here the small mountain town unfolds below, bounded by steep, multihued cliffs. Twin Peaks (10,970’) dominates the landscape to the northwest. Beyond the overlook, the ascent eases as hikers reenter the woods. 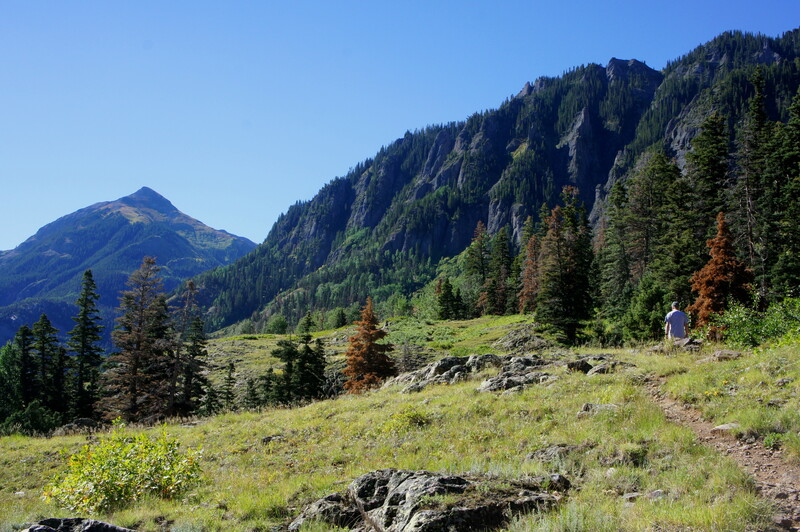 Briefly putting Ouray out of sight, the trail weaves in and out of rocky clearings before climbing again at 7/10 mile. Gaining another 100 feet, the path tops out again as it approaches the rim of a sharp drop-off on the left, which affords more excellent views. 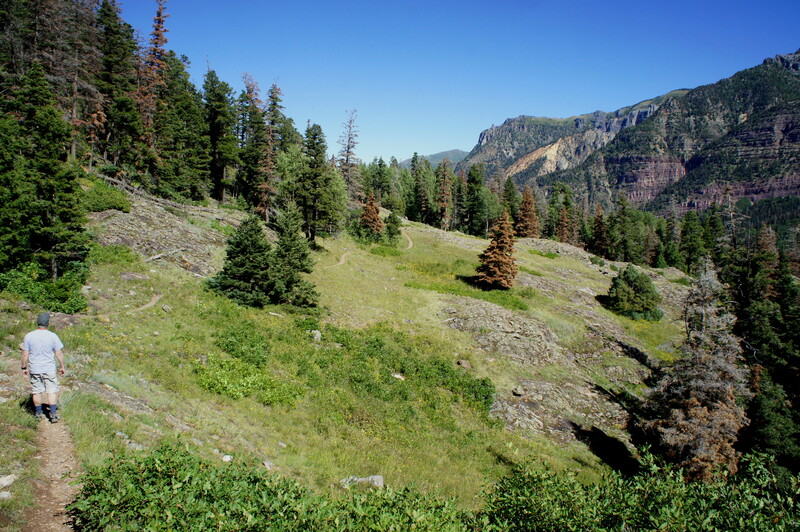 At 9/10 miles, hikers reach the first unobstructed view of Hayden Mountain (13,139’), which rises sharply from the base of the plateau on the right. 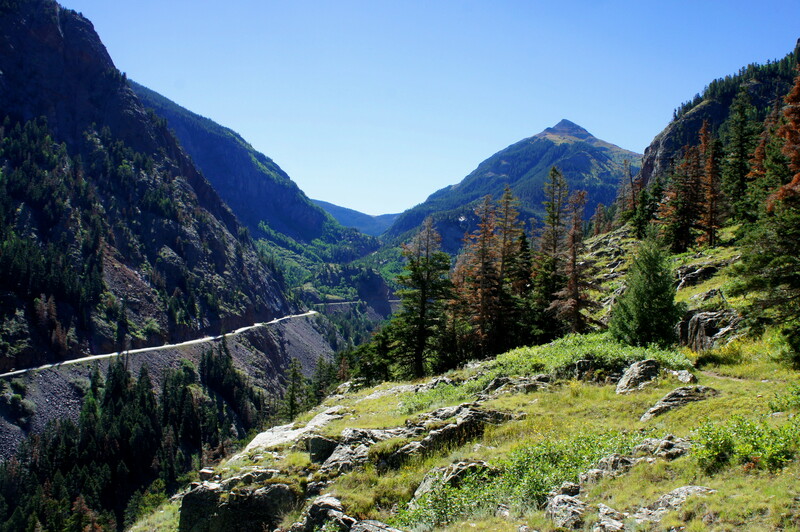 Also look to the south for cone-shaped Abrams Mountain (12,801’), which is even more striking, as the trail rides a wavy hillside through a lengthy clearing. Around 1.4 miles from the start, the Sutton Mine Trail rounds a grassy meadow with a small pond in the shadow of Hayden Mountain. 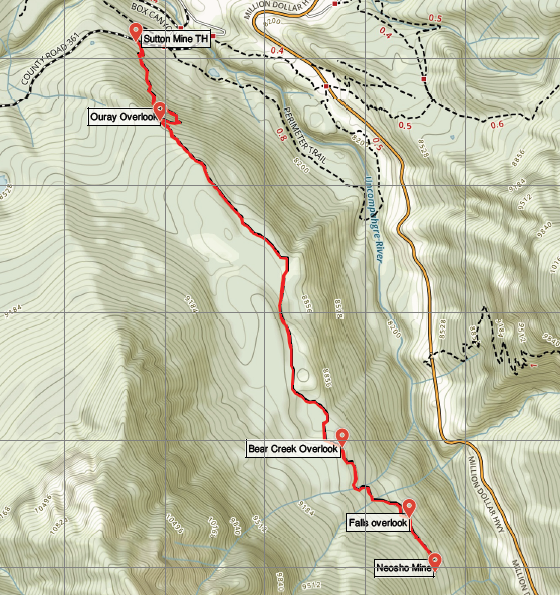 After another brief foray into dense forest, hikers will reemerge into the open at the Bear Creek Overlook at 1.6 miles. Though no better than many other vistas on the hike, the overlook—perched atop a rocky knoll—offers a nice excuse to stop for a snack. The scenery beyond alternates between sun-soaked hillsides and thick woods as the trail descends to cross a pair of streams at 1.75 and 1.8 miles. (Note: The first is likely to be dry in summer, while the second carries water year-round and produces a pleasant cascade.) One of the highlights of the hike is the unmarked but obvious overlook at 1.9 miles, which offers a distant view of Bear Creek Falls down in the gorge below. 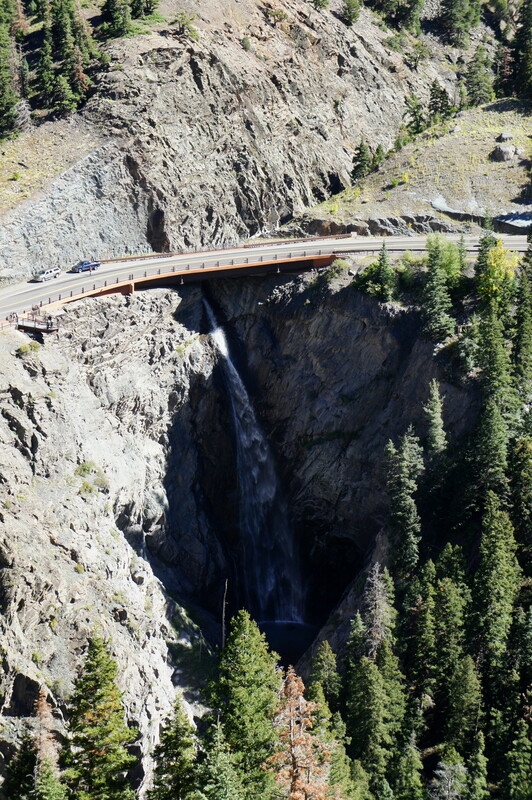 Here Bear Creek tumbles 225 feet in a single drop, making it one of the tallest free-falling waterfalls in Colorado. While some other sites note it may be possible to continue on to the namesake Sutton Mine, the official trail ends at Neosho Mine. The return journey is mostly downhill, reversing the strenuous ascent of the first half-mile. 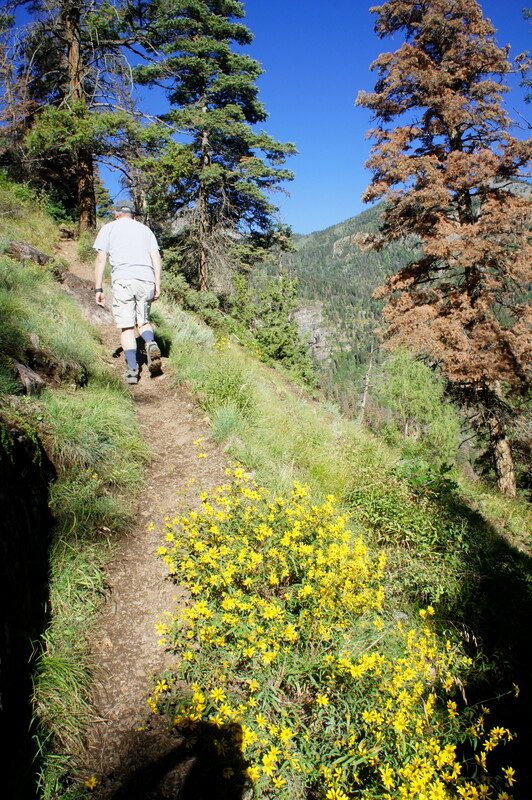 Total trail time will vary widely depending on fitness: hearty hikers will finish in 2 or 2 ½ hours, while others who struggle with elevation could take twice as long. 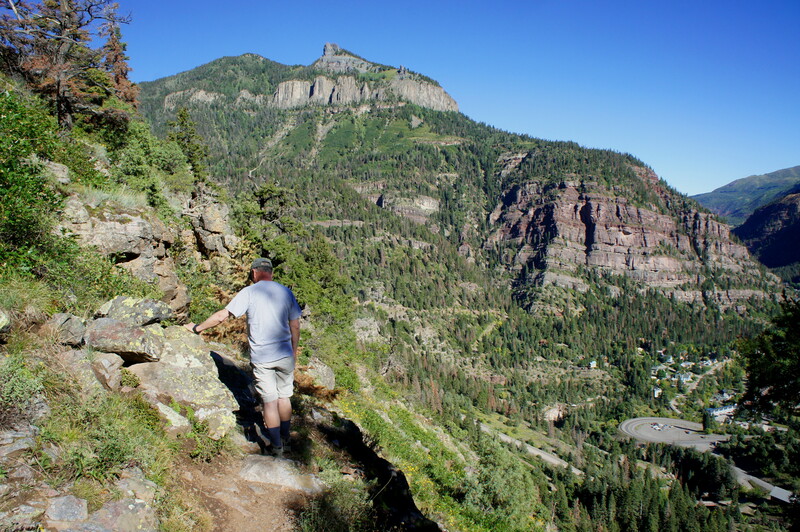 This entry was posted in Colorado, Strenuous Hikes, Uncompahgre National Forest and tagged Abrams Mountain, Bear Creek Falls, Hayden Mountain, historic, mine, Neosho Mine, Ouray, Sutton Mine Trail, Uncompahgre Gorge, Uncompahgre National Forest. Bookmark the permalink. I love this area and get wait to revisit and hit up some of those trails. I have this on my list:) Thanks, Andrew!